All recordings were made by me at St. Joseph of Cupertino Church in Cupertino, CA. The organ is a Rodgers 905B 3-manual digital (with MIDI) integrated with a pre-existing (1950’s vintage) Moeller 4-rank pipe organ. 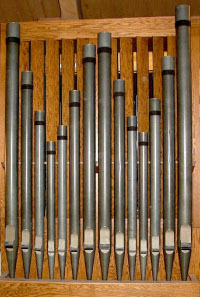 Digital voices (bells, strings, Pan Flute and other orchestral stops as well as organ voices) are from the Rodgers MX-200 sound module or the Rodgers Sound Organ Library (SOL). Chorale Preludes or arrangements of hymns and sacred songs have traditionally been the most frequent organ compositions because they involve tunes familiar to the congregation (“assembly” for Catholics) and directly relate to the worship service (or mass). Many of mine are on songs or hymns familiar only to Catholics and for which there were no preludes or arrangements available. Most are settings of the different verses, with different harmonizations and textures, the melody always clearly heard and (usually) unchanged in the right or left hand or the pedal. Each elegy was written upon the untimely passing of a friend or family member and is dedicated in his or her memory. In these fugues the subject (theme) is a name, or names, for which each letter has been assigned a pitch (i.e. note). While the octave of the pitch and its value (i.e. note duration) can be chosen arbitrarily (such as to create a complete musical phrase) the pitch must be chosen according to some fixed scheme. Except for the one on ‘Susan’ I have used that by Maurice Duruflé who applied it in his famous “Prelude and Fugue on the Name Alain” for organ: The letters “A” through “H” are those of the pitches with the same letter, but the letter “B” has the pitch B-flat, and the letter “H” has the pitch B-natural. These are the German names of these pitches and have traditionally been used for the many pieces written on B-A-C-H. The rest of the alphabet, from I through Z, uses the sequence of white keys starting with A again (i.e. not using B-flat again). Of course, this scheme does not cover names not written with our alphabet or transliterated (e.g. from Cyrillic Alphabet) names into it. Furthermore, since it does not use any of the other four black keys on a keyboard, it has chromatic limitations. These can be alleviated, for example, by adding to the sequence of pitches of the name itself other pitches including the other black keys on the keyboard. But Durufle’s scheme tends to lead to pieces with tonality F-major, D-minor (as in his work on the name Alain), and C-major, or to the Church modes (as in Gregorian Chants) and using no sharps or flats unless transposed. The first three (and short) litanies were written as a set. Litany No. 5 came about when on our way home one night our car hit a possum which was mortally wounded and dragged itself to the side of the street hissing at us. Its death in agony (yet defiance) left a deep impression on me. The ending of this litany eventually led to the beginning of "Requiem Aeternam" (written years later) which, eventually became the first movement of the Requiem. World premiere by James Welch at St. Andrew Episcopal Church in Saratoga, CA. These are in a spirit akin to Cesar Franck’s famous Pièce Heroïque and tributes to the fallen heroes of our Armed Forces. Entrada envisions the festive entrance of a worthy soul into Heaven – welcomed by the saints there. Procession of the Saints envisions the festive processions of the all the saints of the Church at some special occasion in heaven, with ourselves (hopefully!) being spectators and admiring these men and women, who have proven themselves so. Alongside, though, dances a joker playing on his pipe and making a bit of fun of these venerable souls – to remind them (and us) that it is by the grace of the Lord only that they were able to do the great deeds they did and therefore they should not get too impressed with themselves - nor should we who made it “up there” for the privilege to witness their procession. These come in two varieties: Nos.1-3 are plain; the rest are program pieces in the form ABA’ with the middle part in a contrasting volume and texture. Festive Toccata (dedicated to a Japanese family friend) envisions Japan: The outer parts are descriptions of the mad rush of passengers into the famous bullet train – noise and confusion reigns! The middle part is a vision of lovers admiring Mt. Fuji – think of cherry blossoms etc. Toccata for the Working Man was inspired by the pastor of Union Church (were I was then the organist) who took charge of the congregation when he was already well into retirement age. The middle section is a reflection on the story he told how he met his wife many years ago. Toccata-Fantasia has several sections - each a short reflection on a period in our lives and beyond. Transcriptions and Arrangements are relatively simple settings of famous tunes for my own use in playing for funerals or weddings. Sokolov's Movements: I recently transcribed Sokolov's extraordinary Sonata for Organ from his manuscript with some necessary adjustments and re-arrangements of the voices to suit a 3-manual organ but without any additions, deletions or or changes of the original composition. I have placed it on my website with his permission in order to make it available for other organists. As with all the other music on my website, a score of the work is also available. Copyright (c) 2018 www.lotharbandermann.com. All rights reserved. Design by Free CSS Templates.